Tiny House Homestead: Baby It's Cold Outside! Well, not exactly. I know it is June 1st in Phoenix, AZ, but in Oregon come February it will be cold outside. I have been working on the heating conundrum in the back of my mind for some time. It seems the popular method for heating tiny homes is the Dickinson Newport P9000 Propane Heater. While it looks like a lovely little fireplace hanging on the wall, it retails at $900+ and the P12000 is over $1000. I don't know about you, but that seems like a lot of money for me right about now. 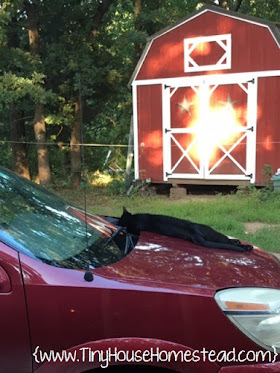 So I began a search for alternative ways to heat my tiny house. I was thinking back the other day to my childhood and some good friends who lived in a house that was over 120 years old. It was a huge farmhouse and drafty as hell. Their solution to help boost the heating of the old oil furnace was to have several kerosene heaters scattered about the house and running 24/7. They were actually quite good at taking the chill off and although rather ugly, they were safe. 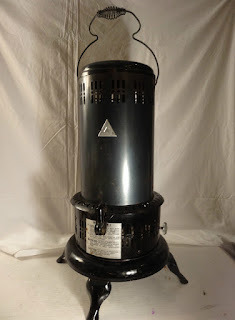 In Pennsylvania and New Jersey kerosene heaters are common. After poking around on the internet I found references to vintage Perfection heaters. Perfection brand kerosene heaters were the primary space heating source for over 3 million homes in 1918 alone (see http://www.milesstair.com/Perfection_History.htm for the history of Perfection heaters.) The company was one of Rockefeller's babies back in the day when he owned all the oil interests. By building a simple, affordable heater, he ensured that his oil would be in high demand. Damn, that guy was brilliant. Guess that is why he was rich and I still work. Perfection heaters were put out of business by electricity, but were still in production well into the 1970's when our "oh so helpful" government decided we needed to be protected from ourselves and came up with kerosene space heater safety features. Now we see the types of heaters like the Aladdin TR6000 shown to the right. Attractive huh? Guess what? Statistically the safety features didn't make any changes in accident statistics and now they are ugly too. Thanks Uncle Sam for looking out for me. I only know of one person injured as a result of a kerosene heater. A neighbor kid, Shaun, who was around 5 at the time, touched the unit. He burned his hand. Guess what? He didn't do it again. Lesson learned. By the way, Shaun burned his hand on a similar unit this model TR6000 by Aladdin, not the vintage heater. I hear tell from my alarmist friends and family that there are all kinds of fires that result from kerosene heaters. 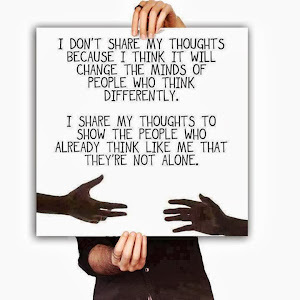 You are probably nodding your head in agreement, but you would be wrong. More electric space heaters cause fires and fatalities than kerosene heaters. The only information I have found about fires or injuries caused by kerosene heaters were operator error; i.e. someone stupid enough to refill them while they were running, they were still hot, refilling inside the house, or overfilling the fuel reservoir. Remember, guns don't shoot people, people shoot people, and stupid people shoot themselves. Same analogy applies to kerosene. Anyway, back to heating my tiny house. There are several factors to consider when heating such a small space with a kerosene heater, but the most important is safety. If you have children or pets, they need to be protected, of course the risk of fire must be accounted for as well, but the most important is Carbon Monoxide poisoning. I resolved this issue by purchasing one of these: Kidde Smoke and Carbon Monoxide Talking Alarm shown in the picture. Best part of this alarm is when the battery is going it doesn't beep, it has a voice that says, "Hey, dummy, change your battery already." Ok, well really it says, "Low Battery,"
Specs for kerosene heaters indicate that they should be 3 feet away from all things on all sides for safety. I have decided that I will be using a set-up much like a wood burning stove where the walls are protected with sheet metal and the unit will remain out of the way of people. I plan to use corrugated galvanized metal to protect the walls from the heat and allow for air flow between the metal and the wall. Done correctly the affect will be pleasing on the eye and completely safe. 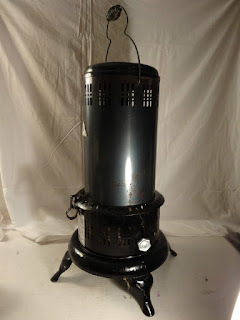 I ended up finding a vintage (late production 1960's or early 1970's) Perfection Kerosene Oil Heater, Black Model #525M-1 which has been restored. 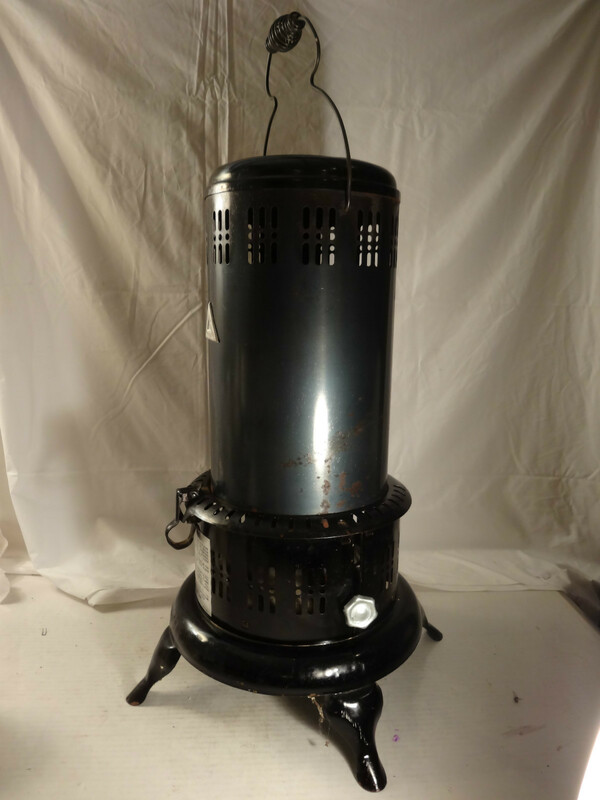 Many of the heaters found on Ebay or at flea markets and tag sales were stored in damp places for extended periods of time and have lots of rust damage and build-up. This unit, while not as pretty as the ones made in the early 1900's, is in FANTASTIC shape. It measures 24.25” tall (30.5”t to top of handle) with feet are roughly 15” apart. That translates to a small footprint which works in my tiny house! The best part? I paid $100 plus $42 shipping. I know there are better deals to be found where folks have colder weather, but in AZ they are scarce so Ebay was my best resource. You may want to try Craigslist in your area first. Still, I saved 90% over the fancy propane model's cost. Let's compare BTU's to see if they are comparable in heat output. "According to the University of Alaska-Fairbanks, kerosene is a more potent fuel source, providing 135,000 BTU in a gallon of fuel. Propane, on the other hand, produces only 91,800 BTU per gallon." To figure out how many BTU's you need to heat a house, use a factor of 20. So if you have a tiny home that is 8' x 20' or 160 sq. ft. and multiply by the factor of 20 you get 3,200 BTU's to heat your space. Do you see it? At no point is the propane unit more cost effective. Ok, so the perfection was definitely the way to go! I totally copied and pasted the following tips, so I want to make sure to give the author, Cordie Kellerman, of Yahoo! Contributor Network, Published to web Decemeber 27, 2008, due credit. - Closely follow the manufacturer's instructions. - When you purchase your space heater, make sure it has been tested at a recognized testing laboratory (check for the label). - Keep a door, or at least a window, open when using your kerosene heater. Kerosene heaters pose not only a fire hazard but a risk for carbon monoxide as well. - Keep your portable heater at least three feet away from any flammable materials. - It is important that you use only 1-K kerosene. The dealer where you purchase the kerosene should be able to verify that the product is 1-K grade. Caution is advised as 2-K kerosene appears clear just like 1-K.
- Gasoline must never be used in a kerosene heater, either full strength or mixed with kerosene. You should not store kerosene in a container that previously held gasoline. Even a very small amount of gasoline residue left in the container can cause the kerosene to become dangerously flammable. - The kerosene heater's fuel tank has a "full" mark on it. Never fill beyond that mark. The fuel will expand as it warms and overfilling can cause a spill and a fire. 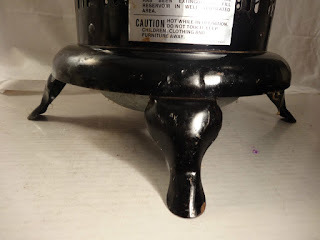 - Maintain your kerosene heater's wick by keeping it clean and cut to the proper length. - Do not remove or adjust the fuel tank when a kerosene heater is hot or in operation. Do not add fuel when the space heater is hot or in operation. - Always take a kerosene heater outside to add fuel. 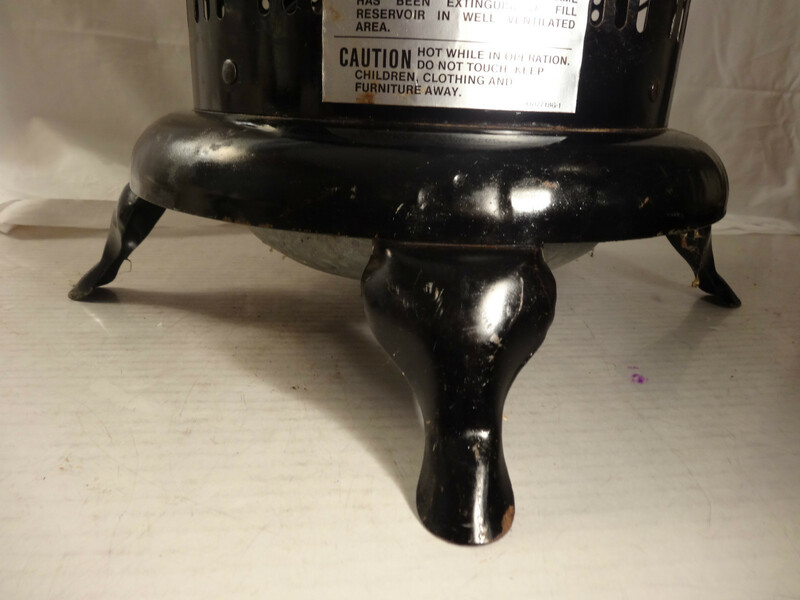 - Make no attempt to move a kerosene heater when it is in operation. If a flare-up occurs, do not try to move it, instead turn off the heater with the manual shut-off switch. If the flames are not extinguished using the switch, or your heater has no switch, then immediately leave the area and call for emergency help. Do not use water or blankets to try to put a kerosene fire out. - Do not operate your kerosene heater while you sleep. - Kerosene should always be stored outside of the house. It should be properly labeled as "Kerosene" and should be stored in the easily identifiable blue container. - Make sure your home has an adequate number of working smoke and carbon monoxide alarms. Check them regularly. That concludes my update on heating. Below are some more photos of my new heater. Now I think I will go for a swim!